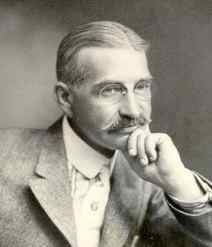 Lyman Frank Baum was born in Chittenango, New York. His father was the oil magnate Benjamin Ward Baum and his mother, Cynthia (Stanton) Baum, was a women's rights activist. Baum grew up with his seven brothers and sisters on a large estate just north of Syracuse. “The cool but sun-kissed mansion... was built in a quaint yet pretty fashion, with many wings and gables and broad verandas on every side," Baum later wrote in Dot and Tot in Fairyland (1901). Until the age of twelve, Baum was privately tutored at home. In the late 1860’s he spent two years at Peekskill Military Academy, where he learned to loathe rigid discipline. In 1873 Baum became a reporter on the New York World. Two years later he founded the New Era Weekly in Pennsylvania. He was a poultry farmer with B.W. Baum and Son, edited Poultry Record, and wrote columns for New York Farmer and Dairyman. Baum's father owned a string of theatres, and Baum left journalism to become an actor. In New York he acted as George Brooks with May Roberts and the Sterling Comedy in plays that Baum, himself, had written. He owned an opera house in 1882-83 and toured with his own repertory company. In 1882 he married Maud Gage; they had four sons. Baum returned to Syracuse in 1883 to the family oil business and worked as a salesman for Baum's Ever-Ready Castorine axle grease. His own endeavor - Baum's Bazaar general store in South Dakota - failed, and the family's fortunes took a downturn. From 1888 to 1890 Baum ran the Aberdeen Saturday Pioneer. He moved to Chicago where, in 1897, he founded the National Association of Window Trimmers and edited Show Window until 1902. Over the next 19 years Baum produced 62 books, most of them for children. In 1899 Father Goose: His Book appeared, which quickly became a best-seller. Baum's next work was The Wonderful Wizard of Oz, a story of little Dorothy from Kansas who is transported with her dog Toto by a ‘twister' to a magical realm. The book, which was illustrated and decorated by W.W. Denslow, was published at Baum's own expense. The book sold 90,000 copies in the first two years. Dorothy is a farmer's daughter who lives in the midst of the great Kansas prairie. A cyclone comes, and her family’s house is swept away with Dorothy and her dog Toto still inside. When it finally lands, Dorothy's house crushes the Wicked Witch of the East. However, Dorothy is greeted by the Good Witch of the North, from whom she gets the dead Wicked Witch's magical silver slippers. On the “Yellow Brick Road” she befriends the Scarecrow, the Tin Woodman, and the Cowardly Lion. After the group makes its way to the Emerald City, they speak with The Great Oz, who promises to grant their requests, but only in the condition that they kill the Wicked Witch of the West. At the witch's castle, Dorothy kills the evil woman with a douse of water. Other novels in the Oz series include The Marvelous Land of Oz (1904), Ozma of Oz(1907), Dorothy and the Wizard of Oz (1908), The Road to Oz (1909), The Emerald City of Oz (1910), The Patchwork Girl of Oz (1913), Tik-Tok of Oz (1914), The Scarecrow of Oz (1915), The Lost Princess of Oz (1917), The Tin Woodman of Oz (1918), The Magic of Oz (1919), Glinda of Oz (1920), and The Visitors from Oz, which was adapted from a comic strip by Baum and appeared in 1960. Baum's former illustrator W.W. Denslow produced stories with Oz characters in the early 1900s. Baum moved to California and for the rest of his life produced sequels. Under the pen name "Edith Van Dyne" he published 24 books for girls, and as "Floyd Akers" he wrote six books for boys. As "Schuyler Staunton" he wrote the novels The Fate of the Clown (1905) and Daughter of Destiny (1906). Some of Baum's books for adults, including The Last Egyptian (1908), dealt with other counties and places. He gathered material aimed at teenagers for works during his motoring tours across the country and travels in Europe and Egypt. 'I shall take the heart,' returned the Tin Woodman; 'for brains do not make one happy, and happiness in the best thing in the world.'" Since its appearance, the story has been filmed many times. The Patchwork Girl of Oz was made in 1914, and Baum himself participated in the project. In 1914-15 Baum was the founding director of Oz Film Manufacturing Company (later Dramatic Features Company) in Los Angeles. It was a well-equipped seven-acre studio on Santa Monica Boulevard. The venture failed and produced only two more Oz stories, His Majesty the Scarecrow of Oz, and The Magic of Cloak of Oz. The most famous film version from 1939, directed by Victor Fleming, starred the sixteen-year-old Judy Garland. It received an Academy Award nomination for Best Picture and was selected to the National Film Registry at the Library of Congress. Originally MGM wanted Shirley Temple for the key role. Judy Garland was tightly bound and corseted to look much younger, and she later revealed her unhappiness while making the film. She was not the only one who suffered during the production. Buddy Ebsen, originally cast as the Scarecrow, had a severe allergic reaction from the aluminum dust used on his face, Margaret Hamilton, who played the Wicked Witch of the West, burned her face and right hand, and Betty Danko was put in the hospital after her broomstick exploded. In the film adaptation of Wizard of Oz, Dorothy (Judy Garland) is knocked unconscious during a tornado. She wakes up in Munchkin Land where the good witch Glinda (Billie Burke) gives her a pair of ruby slippers and refers her to the omnipotent Wizard (Frank Morgan). Dorothy starts the journey on the Yellow Brick Road to the Emerald City and meets a scarecrow (Ray Bolger) in search of brain, a tin man (Jack Haley) seeking a heart, and cowardly lion (Bert Lahr) in need of courage. The Wizard agrees to help them if they secure the broomstick of the Wicked Witch of the West (Margaret Hamilton). When Dorothy and her dog Toto are captured, her three companions try to save her, and the witch is destroyed. The Wizard proves to be a phony, but Dorothy’s friends have found the qualities they sought through their own endeavors. Dorothy is then told to click her slippers together and utter the words 'There is no place like home' and is finally returned to Kansas. While the book insisted that Dorothy actually traveled to Oz, the film reveals that the whole adventure was only her dream. The film can be interpreted in many ways. The Yellow Brick Road represents Hollywood, to which teenage girl's dream of running. Dorothy's journey can be seen as a young girl's last childhood experience, and when she chooses to return home to Kansas, she has matured into a young woman and has abandoned her childhood world of imagination. Baum wanted the children to see that the traditional American values of integrity, self-reliance, candor, and courage would make them succeed despite any obstacles they might face. Born with a congenitally weak heart, Baum was ill through much of his life. He died on May 6, 1919, in Hollywood, where he had moved to a house he called ‘Ozcot.’ The Oz series did not stop. Ruth Plumly Thompson was commissioned by Baum's publisher to write twenty-one titles. Other writers include Baum's great-grand son Roger Baum. The Laughing Dragon of Oz (1934) was composed by Frank Joslyn Baum, the author's son, but he did not have a legal right to publish the book. Salman Rushdie's The Wizard of Oz (1992) deals with the classic film adaptation against the background of universal symbols and myths. Imagination has given us the steam engine, the telephone, the talking-machine, and the automobile, for these things had to be dreamed of before they became realities. So I believe that dreams - daydreams, you know, with your eyes wide open and your brain machinery whizzing-are likely to lead to the betterment of the world. The imaginative child will become the imaginative man or woman most apt to invent, and therefore to foster, civilization. The classic children's tale about farm girl Dorothy's unconscious trip to the mythical Land of Oz: includes the Munchkins, Wicked Witch of the West, and Scarecrow, Cowardly Lion, and Tinman. Continuation of the Oz series, tells the story of the destruction of the Emerald City by the Nome King, who is looking for a Magic Belth. Dorothy and her family have moved to the Emerald City and witness the invading armies. A young boy name Tip escapes from Mombi, a sorceress, and travels to the Emerald City to start his new life. Dorothy is blown overboard on a ship during a storm. She is washed ashore in Ev, a land across the Deadly Desert from Oz. The story of a patchwork doll who is brought to life by a magician. Dorothy and her friends return to Oz for Ozma's birthday.